So to get started with your own LED display projects, check out Riaan's tutorial here. And we're on twitter, so follow us for news and product updates as well. They're simple to use, yet very bright for indoor and outdoor situations. 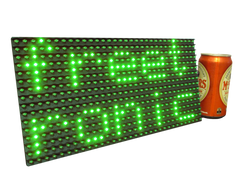 Available in various colours, the 32 x 16 LED matrix can display text and graphics quite easily - and can be daisy-chained together for extended displays. For more information, see our range of Dot Matrix Displays here.